When painting Easter eggs, the bigger the better. This year I found these large paper mache eggs (6″) at Hobby Lobby. I loved the size of them and thought that they would look great in some of my favorite colors with a simple white design on them. You can paint them any color you like, but I chose these DecoArt colors: Baby Pink, Indian Turquoise, Melon, Sunny Day, Sweet Mint, Wisteria, and Snow White for the details. I found it easier to paint half of the egg, let it dry and then paint the other side. An egg carton makes a great stand for holding the eggs while they dry. 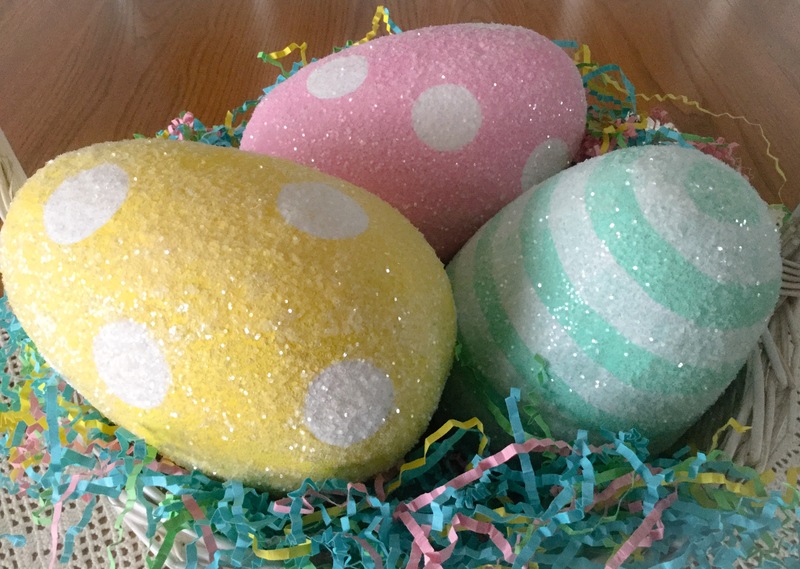 I used a 1″ dauber to put the dots on the eggs. Again I did half of the egg, let it dry and did the other half. To do the stripes I placed a rubber band in the center of the egg. I used this as a guide to paint the stripe. I used a #12 flat brush and followed beside the rubber band to go around the egg. I then moved over and painted he next stripe, continuing to the end of the egg. I allowed the paint to dry and then did the other half. I love the sparkle of glitter on these eggs. I decided to use a plastic glitter that you can get at Michaels on these eggs. I am using them as a center piece and felt that kids might be playing with them so I avoided using a glass glitter. The glitter truly transforms the eggs. Apply white glue such as Elmer’s to half of the egg. Shake on glitter and shake off excess. Allow to dry and then do the other side. These would also be a fun project to do with kids. Mixing paint, glitter and kids together will make for wonderful memories….and maybe a little mess, but that is easily forgotten. They look great in a big basket, but I will show you another way to display them in another post. I hope you enjoy making these eggs. PS. If you are going to do a more detailed design or want a little more sparkle, glass glitter would look wonderful on them. Thank you Cynthia, as you can tell I love the colors of spring.